A family with the last name of Christmas celebrates the holiday in over-the-top style, but their daughter Mary is less than enthusiastic. The family’s Christmas tree is far too large, they have massive piles of gifts, and their house has so many lights that power to their neighborhood is interrupted. 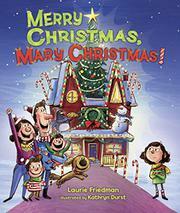 Mary wishes her family’s Christmas were not so lavish, and she tells the department-store Santa all about it. Santa advises her that she needs to find some way to love Christmas herself. On Christmas morning, Mary convinces her family to change their ways, and they pack up their tree, presents, and lights, tying everything on top of their van in comical fashion. They invite everyone in town to a Christmas party, and the community works together to set everything up in a park for a celebration on Christmas night. The story has an obvious message, that excess at Christmas can spoil the holiday, though Santa doesn’t agree with that. There isn’t much underlying motive for Mary’s attitude (it doesn’t seem to be rooted in her name) nor explanation of why her family celebrates to such excess and then abruptly changes. Cartoon-style illustrations in bold colors create a busy, humorous effect with a huge cast of background characters of many ages and ethnicities. The Christmas family and Santa are white.